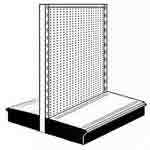 Commercial Retail Shelves & Shelving. Quality retail shelving offers store owners a better chance at making a great first impression. It does not have to cost a lot of money. Just a reasonable investment in sturdy, colorful retail shelves will immediately differentiate a store from its competition. New retail shelving places the most expensive and sought after items in the best possible spotlight. Special displays for Christmas and after Christmas sales events have a much better chance of attracting the eye than standard shelving typically offers. Adjustability, decorative appeal, and space management ability differentiate Easy Rack retail shelves from inferior, generic racks and displays. Because each unit can be adjusted as a standalone piece or used in combination with other units, more can be done with less. Double-sided retail shelves are made to run parallel to one another and create shopping aisles between the merchandise. Because these units are made with a solid-piece construction, they are very easy to move and rearrange in different directions. This is often done in grocery stores, where certain aisles containing supplements and over the counter medication are arranged perpendicular to food aisles. 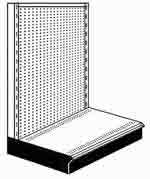 Single-sided retail shelving is used to create displays along walls and to stand at the end of aisle shelving as end caps. End caps are extremely important to Christmas sales because they place the hottest items right in the customers’ line of sight. Almost every larger store has wall space that is going to waste, and almost every gas station and convenience store has either an empty corner or a space between the lotto stand and ATM. Both wall shelving and aisle shelving units measure 48” from side to side. This is the key to fitting individual units into these types of tight spots. Adjustable retail shelving is the key to more attractive displays. If all the shelves on a retail display rack are set to identical depths, top shelves will block light attempting to reach the lower shelves. This makes it hard for customers to read labels and notice the features of various products. On the other hand, varying the depth of higher and lower shelves allows light to be distributed throughout the display rack. Also, the ability to move shelves either up or down allows for retail displays to be customized to the size of products themselves. Because each shelf can support up to 350 pounds of weight, virtually any product can be placed at any height for greater visual impact. The right kind of retail shelves can be a key component of loss prevention. Many store owners make the mistake of buying the tallest display shelving available. They believe this gives them more room to merchandise a greater amount of inventory. Unfortunately, retail shelving that is more than 84” tall is likely to block visibility essential to loss prevention monitoring. Even cameras cannot see over shelving that is too tall. In our experience, 72”-84” display racks are the tallest units that any store should invest in. 72” or less is better for gas stations and convenience stores that have extremely limited space. Smaller shelving is also recommended for gift shops and accessories stores. This allows employees to watch customers either directly or with security mirrors, and makes it easier to conceal cameras at unique angles to ensure customer honesty at all times. Easy Rack carries a wide variety of commercial shelving, material handling equipment, used pallet racks, and modular prefab buildings installed nationwide. If you can not find what you are looking for call us toll free at 1-888-776-3720 and we will find it for you. Our home office is located in Houston, Texas with warehouses located throughout the United States that enable us to service all 50 states including Washington DC, Nashville-Davidson, Tennessee, Las Vegas, Nevada. Portland, Oregon, Oklahoma City, Oklahoma, Tucson, Arizona, Long Beach, California, Atlanta, Georgia, Fresno, California, Sacramento, CA, Corpus Christi, TX, Plano, Texas, Garland, TX, Laredo, Texas, Lubbock, TX, Jersey City, NJ Newark, New Jersey.